Capsule Summary: Hawkeye tries to juggle a hot date with helping a soldier marry a South Korean woman with whom he has a child. Usually in my episode reviews I write a few paragraphs about the plots of the various storylines and then some random comments and observations. With this episode, I’m more interested in the comments and observations than the plot. I’m not a fan of either storyline, to be honest. Hawkeye and Trapper blackmailing Lt. Willis into signing Corporal Walker’s paperwork wasn’t anything special. Neither was Hawkeye’s repeatedly interrupted date with Lt. Hoffman even with its twist ending. Frank and Margaret aren’t given much to do in this episode but the scenes they are in are quite good, particularly when they’re complaining to Colonel Blake. Margaret talking for Frank never gets old and her slow emotional collapse while listening to Frank talk about the strength of his marriage was classic early series Hot Lips. There’s so much going on in the opening scene to this episode. Lots of familiar faces. Everyone is in the Mess Tent watching an unnamed movie. Colonel Blake is engrossed in the movie; Trapper is busy with a nurse (Marcia Gelman); Father Mulcahy looks uncomfortable; another nurse (Sheila Lauritsen) is getting very close to a corpsman under a poncho; Radar is in the middle of eating some fried chicken while Nurse Kellye stares at him lovingly; a nurse (Gwen Farrel) has her arm around Klinger, who discreetly covers his knee with his dress; Igor is in the background watching the movie; and Hawkeye is trying to get Lt. Hoffman’s attention. It’s likely the opening scene was shot either before or after the closing scene in which Corporal Walker gets married because everyone in the background of that scene (Gelman, Lauritsen, etc.) was also in the Mess Tent scene. There’s a lot of talk about movies throughout the episode. While we never learn what movie the camp was enjoying in the opening scene we do know that the following night they’re going to see Flying Leathernecks with John Wayne, from 1951. The P.A. announcement about Flying Leathernecks also mentions Ward Bond and Maureen O’Hara who actually weren’t in the movie. When that movie doesn’t arrive in time, Colonel Blake decides to show Bonzo Goes to College (a real movie from 1952) as well as The Thing That Ate The Bronx (a fake movie). Later, after Flying Leathernecks still hasn’t shown up, Bonzo Runs for President (another fake movie) is shown alongside The Thing That Ate The Bronx. Although unconnected to either of the storylines in the episode, I think all the movie talk adds a lot. Speaking of movies, Trapper calls Hawkeye “Andy” after Hawkeye asks “Dad” for the car. This is a period accurate reference to the Andy Hardy movies released between 1937 and 1946, all starring Mickey Rooney. A final film came out in 1958, long after the Korean War ended. Notice the odd camera angle from behind Frank’s bunk when Hawkeye and Trapper are discussing Lt. Hoffman’s handshake. When Colonel Blake has his head down on his desk you can see writing on his day planner. As I’ve mentioned many times before, I’m curious about who was responsible for things like this. 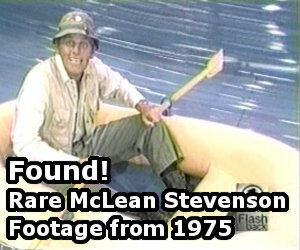 Did McLean Stevenson scribble out some notes? Was it someone from the prop department? The book Hawkeye is reading while waiting for Lt. Willis to wake up is Badman’s Roost by Robert E. Trevathan. It was published in 1963. I spent the entire episode wondering why I recognized the actor playing Lt. Willis, Burt Young. I discovered afterward that he played Paulie Pennino in the Rocky movies. Not relevant to the plot (and no offense to recently deceased Marcia Strassman), but I believe the actress playing Lt. Hoffman may be the most attractive to ever appear on M*A*S*H (in my admittedly biased opinion). I think this is one of those rare early occasions where Hawkeye could actually be serious, and he was when it came to trying to cut through all the red tape so Walker could marry his Korean baby mama, which sort of wasn’t uncommon back in those days: if ever there was a baby that was had out of wedlock, the man would marry the woman he had the child with to right the wrong, so to speak. And it was an interesting twist that Lieutenant Hoffman turned out to be a racist bigot; I’m glad Hawkeye chose principals over her good looks and walked out on her (and blew her a raspberry). Fr. Mulcahy was such a perv watching Trapper and that nurse making out….and from the corners of his eyes, no less!! I guess in those days, a lot of people felt like Lt. Hoffman, resenting the GIs marrying the local women, except they probably never said anything. Maybe the Lt. felt comfortable and thought Hawkeye felt the same way and expressed her thoughts to him. I’m glad that Hawkeye, for once, thought with his brain and not his emotions and rejected her for the racist idiot that she so obviously was. Some of the schemes that Hawkeye and Trapper cooked up were so outrageous, they would work only on TV. Example: Threatening Frank in ‘George’ and then ‘Lt. Willis’ in this episode. Their whole case would have collapsed had someone questioned them further, yet they emerge triumphant each time. Only on TV!! I have to say one thing about this episode, and it has quite the story to it. When I first saw this episode, I really did recognize Lt. Willis as some actor that I couldn’t place. I knew him, I just couldn’t place him. For many times I watched this episode, re-watched movies, etc but alas I couldn’t find this actor, even when typing his name into Google, I couldn’t get Rocky to come up (Google must have been on vacation). So one evening I’m sitting on the couch being lazy and I turn on the tube and what do I know the last 15 minutes of the original Rocky is on, I see Burt and not thinking about the MASH episode, I just get him on my mind after just watching this movie on TV. Well, ironically enough MASH is coming on next and what do you know, L.I.P. is showing. That was when I finally placed Burt Young from Rocky to MASH. This all happened over at least a two year time period. Morale of story is things work there way out eventually, it just may take a while. L.I.P.,in my opinion, seemed an uneven episode. It was strange to see a pre- Rocky Burt Young in it. I was relieved that Hawkeye didn’t give in to Lt. Hoffman’s racist opinion and romanced her further. What I don’t understand is, when the wedding took place at the end of the episode, Trapper said something to the child of the bride and groom, I heard canned laughter, even though what he said wasn’t particularly funny. Another area in which the historical accuracy of MASH falters. From the people I’ve known who served in Korea, the locals were often treated little better than blacks were treated back in the states. And many GIs displayed an arrogant attitude of entitlement – a “we’re over here saving your country” mindset. Please re-watch the opening scene, there is a couple making out directly behind father mulcahy. You can’t see who it is, but when the movie ends and the camera pans back, the 2 people behind the father are both men. Was this the first gay couple on TV, snuck in and nobody noticed? I like this episode for the simple way it handles the racism of Lt. Hoffman and doesn’t spend the entire episode dwelling on it. Can you imagine how they would have done this in season 10? I think it would have been a little more heavy handed than simply Hawkeye blowing someone the raspberry. Now, as for Burt Young, the comedy comes from how miscast he is. He’s basically doing method acting in a TV sitcom. It’s good, but it just doesn’t fit at all. I did like his line at end when he says something like, “Let’s see him try to get an apartment back in the states with a Korean wife.” It’s a throwaway line, but it very succinctly expresses the racism of the day and leads nicely into the next scene with Lt. Hoffman.